Divje Babe is the oldest known archaeological site in Slovenia. 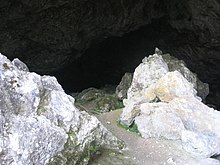 The location of the site is a horizontal cave, 45 metres (148 ft) long and up to 15 metres (49 ft) wide; it is 230 m (750 ft) above the Idrijca River, near Cerkno, and is accessible to visitors. Researchers of Pleistocene climate change working at the site have uncovered more than 600 archaeological items in at least ten levels, including twenty hearths and the skeletal remains of cave bears. According to the museum's statements, the presumed flute has been associated with the "end of the middle Pleistocene" and with Neanderthals, about 55,000 years ago. In the 1920s and 1930s, archaeologist Srečko Brodar (father of Mitja Brodar) discovered tens of bones with holes at another site, the Potok Cave (Slovene: Potočka zijalka) in the Eastern Karawanks, but almost all of them were destroyed during the World War II Italian annexation. Of those still preserved, the best known is a mandible of a cave bear with three holes in the mandibular canal. Since World War II, like specimens have been found in Mokrica Cave (Slovene: Mokriška jama) and Betal Rock Shelter (Betalov spodmol). These bones are preserved today at the National History Museum of Slovenia as well. According to Mitja Brodar, who discovered many of them, bones with holes have been dated only to the end of the Mousterian and the beginning of the Aurignacian, and have not yet been found in Western Europe. Brodar assumes these bones are still not recognized by the international research community due to the fact that most of them were found in France, and the Paleolithic is still considered to be the French's domain. Bones with holes such as those found in the Potok Cave have been ascribed to modern human Cro-Magnon, and Mitja Brodar asserts that they are an element of the Central European Aurignacian. He further posits that the Divje Babe Flute is a product of modern humans, but this has been disputed by other Slovene scholars. In 1995, archeologist Ivan Turk of the Slovenian Academy of Sciences and Arts found the approximately 43,100-year-old cave bear femur at the Divje Babe site near a Mousterian hearth. Because it has the characteristics of a flute, he dubbed it a Neanderthal flute. Whether it is actually a flute created by Neanderthals is a subject of debate. It is broken at both ends, with two complete holes and what may be the incomplete remains of one hole at each end, meaning that the bone may have had four or more holes before being damaged. The bone fragment is the diaphysis of the left femur of a one- to two-year-old cave bear and is 133.6 mm (5.26 in) long. The maximum diameter of the two complete holes is 9.7 mm (0.38 in) and 9.0 mm (0.35 in). The distance between the centers of the holes is 35 mm (1.38 in). If the bone is indeed a usable flute, it would be an argument for the existence of music 43 thousand years ago. Thus Ivan Turk has asserted that, whether the holes are "artificial" (made by man) or "natural" (punctures from a carnivore bite), origin is the "crucial question." 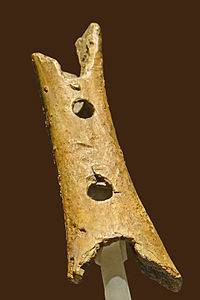 An equally critical issue is that, if the holes in this "flute" are of artificial origin, to date there does not seem to be any available means to determine whether they were deliberately drilled 43 thousand years ago, or are of a more contemporary origin (as part of an elaborate hoax, perhaps). The bone has become a noted attraction in the National Museum of Slovenia, publicized on official Slovenian websites, aired on TV with tunes played on a clay replica, and is a source of Slovenian national pride. Paintings were made, models constructed, and musicians such as biology professor and flautist Jelle Atema have played them publicly. French-based Italian taphonomist Francesco D'Errico, as well as Claus-Stephan Holdermann, Jordi Serangeli, Philip G. Chase, and April Nowell have all hypothesized its carnivore origin. The probability that four randomly placed holes would appear in line in a recognizable musical scale is very low according to an analysis made by Canadian musicologist Bob Fink in 2000. Responding to the D'Errico carnivore-origin hypothesis, Turk pointed out that the features "common" between the carnivore-origin artifact and other chewed bones studied by D'Errico (see Hole shape below) do not include the alignment of the holes. There is also no evidence that the two holes could have been bitten at the same time. The tooth spans were analyzed by all taphonomists concerned to see if any animals could bite two or more such holes at once. No match could be found to any known animals. If a match had been found, it could have been cited as prima facie evidence that the holes were animal-made. This was noted by Turk in his book and was also noted from the opposing hypothesis holders Nowell and Chase in their article in the August/October 1998 issue of Current Anthropology. Nowell wrote that holes in the specimen "were almost certainly made sequentially rather than simultaneously and that the distance between them has nothing to do with the distance between any two teeth in a wolf's jaw." Iain Morley, despite his holding the carnivore-origin hypothesis, observed in his November 2006 article that, "[w]hilst the collections of cave bear bones examined by D'Errico...as well as those discussed by Turk...do show similar shaped and damaged holes...none of these occur in the diaphysis of a femur," as is found on the reputed flute. Marcel Otte (director of the Museum of Prehistory, University of Liege, Belgium) pointed out in an April 2000 article in Current Anthropology that there is a possible thumb-hole on the opposite side of the Divje Babe bone, which, making five holes, would perfectly fit a human hand. Turk wrote in the Massachusetts Institute of Technology book The Origins of Music: "If this probability [of having lined-up holes looking like a flute] were greater (and of course it isn't), it is likely that there would have been more such finds, since...carnivores in cave dens were at least as active on bones, if not more so, than people in cave dwellings...". In 2015 Cajus G. Diedrich suggested the holes could be explained by scavenging from spotted hyena. D'Errico made an analysis of the artifact in comparison to cave-bear bone accumulations where no hominid presence was known. They published photos of several bones with holes in them which had more or less circular holes similar to those found in the artifact, but they did not have a single bone coming even close to the linear alignment of Turk's holes. Ignoring the probability of the alignment of the holes, D'Errico's interpretation was that it was possible for the holes to have been made by an animal, and they concluded that of the available options this was the most likely. D'Errico insisted on ignoring the probability of the alignment of the holes and, even after having analyzed the artifact firsthand, claimed that "the presence of two or possibly three perforations on the suggested flute cannot therefore be considered as evidence of human manufacture, as this is a common feature in the studied sample." Turk conducted laboratory experiments which pierced holes in fresh bear bones in the manner of carnivore punctures, and in every case, the bones split. Yet in the Divje Babe instance, the bone did not break, a fact not matching expectations of carnivore action, as Turk's results showed. Turk wrote, in his book and in his article in MIT's Origins of Music anthology, the bone shows no "counter-bites" that one would normally expect on the other side of the bone matching the immense pressure necessary for a bite to make the center holes. Turk's 1997 book reported that the holes have similar diameters which would accommodate fingertips, and all are circular instead of oval (as carnivore bites often are). Furthermore, all are in the proper ratio of bore size to hole size found in most flutes, and the bone is the kind (femur) usually used for bone flutes. An examination of the specimen using computed tomography was published in 2005 by Ivan Turk, in which he concluded that "the two partially preserved holes were formerly created before the damage...or before the indisputable intervention of a carnivore." The National Museum of Slovenia argues that this evidence has "finally refuted hypotheses that the bone was perforated because of a bear bite". The manufacture by Neanderthals "is reliably proven" and its significance in the understanding of their capabilities and the development of music and speech is secure. The issue of how much bone marrow remains in the artifact is important, because the making of flutes from bone usually includes removing the marrow. Turk et al. (in the volume Moussterian Bone Flute, p. 160) wrote that "the marrow cavity is basically cleaned of spongiose. The colour of the marrow cavity does not differ from the colour of the external surface of the bone. So we may conclude that the marrow cavity was already open at the time.... Otherwise, it would be a darker colour than the surface of the bone, as we know from coloured marrow cavities of whole limb bones." April Nowell stated in an interview that "at Turk's invitation, [Nowell] and Chase went to Slovenia last year... They came away even more skeptical that the bear bone had ever emitted music. For one thing, both ends had clearly been gnawed away by something, perhaps a wolf, seeking greasy marrow. The holes could have simply been perforated in the process by pointed canine or carnassial teeth, and their roundness could be due to natural damage after the bone was abandoned. The presence of marrow suggests that no one had bothered to hollow out the bone as if to create an end-blown flute. Says Nowell, '[Turk's] willing to give it the benefit of the doubt, whereas we're not.' "
Illustration of the diatonic flute by Bob Fink. Bob Fink claimed in his essay in 1997, that the bone's holes were "consistent with four notes of the diatonic scale" (do, re, mi, fa) based on the spacing of those four holes. The spacing of the holes on a modern diatonic (minor scale) flute are unique, and not evenly spaced. In essence, Fink said, they are like a simple fingerprint. The Divje Babe bone's holes matched those spacings very closely to a series of note-holes in a minor scale. In a 2011 article, Matija Turk published the results of a collaboration with Ljuben Dimkaroski, an academic musician who had made replicas of the artifact. The authors argue that the instrument encompassed a range of two and a half octaves, which can be extended to three octaves by overblowing. Dimkaroski created over 30 wooden and bone replicas of the flute and experimented with them. The replicas were made from femurs of juvenile brown bears provided by the Hunters Association of Slovenia, but also calf, goat, pig, roe and red deer bones. In the end, he concentrated on playing a replica made on a femur of a juvenile cave bear from Divje Babe I Cave, to come as close as possible to the dimensions of the original. ^ a b c Brodar, Mitja (26 September 2008). ""Piščalka" iz Divjih bab ni neandertalska" [The Divje Babe "Flute" is not Neanderthal] (in Slovenian). Archived from the original on 28 July 2011. ^ a b Diedrich, Cajus G. (1 April 2015). "'Neanderthal bone flutes': simply products of Ice Age spotted hyena scavenging activities on cave bear cubs in European cave bear dens". Open Science. 2 (4): 140022. doi:10.1098/rsos.140022. PMC 4448875. PMID 26064624. Archived from the original on 11 October 2017. Retrieved 7 May 2018 – via rsos.royalsocietypublishing.org. ^ "Neanderthal Flute – the Flute from Divje Babe". Natural History Museum of Slovenia. Archived from the original on 3 January 2017. Retrieved 2 January 2017. ^ Omerzel-Terlep, Mira. "Koščene piščali: pričetek slovenske, evropske in svetovne instrumentalne glasbene zgodovine" [Bone flutes: Beginning of the history of the instrumental music in Slovenia, Europe, and world] (PDF). Etnolog (in Slovenian): 292. ISSN 0354-0316. Archived (PDF) from the original on 2013-04-04. ^ Omerzel-Terlep, Mira. "Koščene piščali: pričetek slovenske, evropske in svetovne instrumentalne glasbene zgodovine" (PDF). Etnolog (in Slovenian): 292. ISSN 0354-0316. Archived (PDF) from the original on 2013-04-04. ^ Blackwell, Bonnie A. B. (2006). "Electron Spin Resonance (ESR) Dating in Karst Environments" [Določanje starosti v krasu s pomočjo elektronske spinske resonance (ESR)] (PDF). Acta Carsologica. Ljubljana: SAZU, IZRK ZRC SAZU. 35 (2): 123–153. doi:10.3986/ac.v35i2-3.236. ISSN 0583-6050. Archived (PDF) from the original on 2007-01-09. ^ "Neanderthal Man Moves Up the Evolutionary Scale" Times (London), April 5, 1997. ^ "Neanderthal Flute". Ukom.gov.si. Archived from the original on 2015-05-27. Retrieved 2015-05-27. ^ "tunes played on a clay replica". Youtube.com. Archived from the original on 2013-02-27. Retrieved 2012-01-06. ^ Chase, Philip G.; Nowell, April (1998). "Taphonomy of a Suggested Middle Paleolithic Bone Flute from Slovenia". Current Anthropology. 39 (4): 549–53. doi:10.1086/204771. ^ Journal of World Pre-history pp. 36–39, Vol 17, #1, March 2003. ^ "Early Music". Science. 276 (5310): 203g–205. 1997. doi:10.1126/science.276.5310.203g. ^ Turk, Matija; Dimkaroski, Ljuben (2011). "Neandertalska piščal iz Divjih bab I: stara in nova spoznanja" [Neanderthal flute from Divje babe I: old and new findings] (PDF). In Toškan, Borut (ed.). Drobci ledenodobnega okolja. Zbornik ob življenjskem jubileju Ivana Turka [Fragments of Ice Age environments. Proceedings in Honour of Ivan Turk's Jubilee]. Ljubljana: Založba ZRC, ZRC SAZU. pp. 251–65. ISBN 978-961-254-257-3. Archived (PDF) from the original on 2015-05-28. Brodar, Mitja. 2009. Stara kamena doba v Sloveniji = Altsteinzeit in Slowenien. Ljubljana, samozalozba. Chase, Philip G.; Nowell, April (1998). "Taphonomy of a Suggested Middle Paleolithic Bone Flute from Slovenia". Current Anthropology. 39 (4): 549–53. doi:10.1086/204771. Chase, Philip G.; Nowell, April (2002). "Ist der Knochen eines Höhlenbären aus Divje Bebe, Slowenien, eine Flöte des Neandertalers?" [Is a cave bear bone from Divje Babe, Slovenia, a Neanderthal flute?]. In Hickmann, Ellen; Kilmer, Anne Draffkorn; Eichmann, Ricardo (eds.). Studies in Music Archaeology III, Part I. The Archaeology of Sound: Origin and Organisation. Papers from the 2nd Symposium of the International Study Group on Music Archaeology at Monastery Michaelstein, 17-23 September 2000. Rahden: Leidorf. pp. 69–81. ISBN 978-3-89646-640-2. D'Errico, Francesco; Villa, Paola; Llona, Ana C. Pinto; Idarraga, Rosa Ruiz (1998). "A Middle Palaeolithic origin of music? Using cave-bear bone accumulations to assess the Divje Babe I bone 'flute'". Antiquity. 72 (275): 65–79. doi:10.1017/S0003598X00086282. D'Errico, Francesco (2003). "Archaeological Evidence for the Emergence of Language, Symbolism, and Music—An Alternative Multidisciplinary Perspective" (PDF). Journal of World Prehistory. 17: 1–70. doi:10.1023/A:1023980201043. Retrieved 2015-05-27. Edgar, Blake (1998). "Could Neanderthals Carry a Tune?". California Wild. California Academy of Sciences. 51 (3 [Summer]). Archived from the original (subscription required) on 2007-03-12. Retrieved 2007-01-02. Fink, Bob (2000). "Odds calculated against Neanderthal flute being a chance product of animal bites". Archived from the original on 2006-05-27. Retrieved 2006-05-27. Fink, Bob, 2002-3, "The Neanderthal flute and origin of the scale: fang or flint? A response," in: Ellen Hickmann, Anne Draffkorn Kilmer and Ricardo Eichmann (Eds. ), Studies in Music Archaeology III, Verlag Marie Leidorf GmbH., Rahden/Westf. Germany, pp 83–87. Probability analysis. Holdermann, Claus-Stephan; Serangeli, Jordi (1999). "Die 'Neanderthalerflöte' von Divje-Babe: Eine Revolution in der Musikgeschichte?". Musica Instrumentalis: Zeitschrift für Organologie. 2: 147–57. Morley, Iain (October 2003). The Evolutionary Origins and Archaeology of Music (PDF) (PhD Thesis). Darwin College Research Reports. Cambridge University. Morley, Iain (2006). "Mousterian musicianship? The case of the Divje babe I bone". Oxford Journal of Archaeology. 25 (4): 317–333. doi:10.1111/j.1468-0092.2006.00264.x. Otte, Marcel (2000). "On the Suggested Bone Flute from Slovenia". Current Anthropology. 41 (2): 271–272. doi:10.1086/300129. PMID 10702145. Turk, Ivan (2003). "Neanderthal flute". Retrieved 2015-05-27. Turk, Matija and Dimkaroski, Ljuben. 2011. "Neandertalska piščal iz Divjih bab I: stara in nova spoznanja", "Neanderthal Flute from Divje babe I: Old and New Findings" (English & Slovenian). Opera Instituti Archaeologici Sloveniae : Založba ZRC SAZU, Ljubljana 21:251-265. Turk, I; Blackwell, B; Turk, J; Pflaum, M (2006). "Résultats de l'analyse tomographique informatisée de la plus ancienne flûte découverte à Divje babé I (Slovénie) et sa position chronologique dans le contexte des changements paléoclimatiques et paléoenvironnementaux au cours du dernier glaciaire". L'Anthropologie. 110 (3): 293–317. doi:10.1016/j.anthro.2006.06.002. Wallin, Nils, Björn Merker, and Steven Brown, eds. 2000. The Origins of Music. Proceedings of the First Florentine Workshop in Biomusicology, Fiesole, 1997. Cambridge, Mass. : MIT Press. ISBN 0-262-23206-5. Yu, Edwin S.K. ; Bonnie A.B. Blackwell; Ivan Turk; Joel I. B. Blickstein; Anne R. Skinner; Mimi N. Divjak (2001). "ESR Dating Human Cultural Evolution and Climatic Change During the Late Pleistocene at Divje Babe I, Slovenia". Poster session paper abstract. Boulder, CO: Geological Society of America. Retrieved 2006-12-29. Wikimedia Commons has media related to Divje Babe Flute. John H. Lienhard (1997). "Very Early Music". The Engines of Our Ingenuity. Episode 1232. NPR. KUHF-FM Houston. Bower, B. (1998). "Doubts Aired over Neandertal Bone 'Flute'". Science News. 153 (14): 215. doi:10.2307/4010441. JSTOR 4010441. Fink, Bob (2003). "Who made Neanderthal Flute? Humans or carnivores? Summary of Turk's evidence". Retrieved March 1, 2003. Lau, Beverly; Blackwell, Bonnie A. B.; Schwarcz, Henry P.; Turk, Ivan; Blickstein, Joel I. (1997). "Dating a flautist? Using ESR (electron spin resonance) in the Mousterian cave deposits at Divje Babe I, Slovenia". Geoarchaeology. 12 (6): 507–36. doi:10.1002/(SICI)1520-6548(199709)12:6<507::AID-GEA2>3.0.CO;2-2. "Dating a Flautist? Using ESR (Electron Spin Resonance) in the Mousterian Cave Deposits at Divje Babe I, Slovenia". Retrieved 2006-01-22. "'Neanderthal bone flutes': simply products of Ice Age spotted hyena scavenging activities on cave bear cubs in European cave bear dens". Retrieved 2015-07-12.